Way ahead of its time in 1942, and breaking the link between genetics and culture, this book still contributes essential and salient perspectives as we face the ongoing issue of race. The biography of legendary warrior and WWII hero Gregory "Pappy" Boyington. When the shooting stopped, the stubbornly independent Boyington lived a life that went beyond what even the most imaginative might have expected. CBI - China: Day 42 of 154 of the Japanese Invasion of Manchuria. Spain: Day 105 of 985 of the Spanish Civil War. CBI - China: Day 10 of 29 of the 1st Battle of Suiyuan. Spain: Day 470 of 985 of the Spanish Civil War. CBI - China: Day 115 of 2,987 of the 2nd Sino-Japanese War. Day 78 of 106 of the 2nd Battle of Shanghai. Day 59 of 70 of the Battle of Taiyuan. Spain: Day 835 of 985 of the Spanish Civil War. CBI - China: Day 480 of 2,987 of the 2nd Sino-Japanese War. Day 18 of 81 of Japan's Operation GUANGDONG. CBI - China: Day 845 of 2,987 of the 2nd Sino-Japanese War. USA: For the first time in American history, a peacetime draft begins. A lottery system is used to select men to serve for twelve months. as the draft lottery gets underway. The Selective Training and Service Act of 1940 was the first peacetime conscription in United States history. This Selective Service Act required that men between the ages of 21 and 35 register with one of 6,443 local draft boards. Later, when the US entered World War II, all men aged 18 to 45 were made subject to military service, and all men aged 18 to 65 were required to register. Each local draft board assigned a number to all registrants and men were then selected through a national lottery system. In Washington, papers with the numbers 1 through 7,836 printed on them were put into capsules, one number to a capsule. 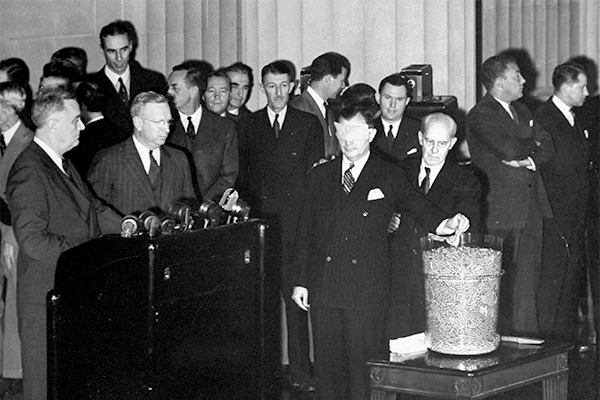 The capsules were dumped into a giant fishbowl, stirred and then drawn from the bowl one by one to establish the draft order. Secretary of War Henry Stimson, blindfolded, reached into the bowl and pulled out the first capsule. From a nearby podium, FDR announced the number drawn: 158. Across the country, 6,175 young men held that number. The Selective Training and Service Act provided that not more than 900,000 men were to be in training at any one time, and it limited service to 12 months. By the early summer of 1941, however, President Roosevelt asked the US Congress to extend the term of duty for the draftees beyond twelve months. On 12 Aug 41, the US House of Representatives approved the extension by a single vote. Many of the soldiers drafted in October 1940 threatened to desert once the original twelve months of their service was up. Many of these men painted the letters "O," "H," "I," and "O" (OHIO) on the walls of their barracks in protest. These letters were an acronym for "Over the hill in October," which meant that the men intended to desert upon the end of their twelve months of duty. Desertions did occur, but they were not widespread. Following the Japanese Attack on Pearl Harbor, thousands of American men and women swelled the United States' military ranks by volunteering for service, and thousands more by conscription. ETO - UK: Day 54 of 258 of the Blitz. ETO - UK: Day 112 of 114 of the Battle of Britain. The RAF bombs Berlin for 25th time. East Africa: Day 142 of 537 of Italy's East African campaign in the lands south of Egypt. CBI - China: Day 1,211 of 2,987 of the 2nd Sino-Japanese War. Day 350 of 381 of the Battle of South Guangxi. CBI - Thailand: Day 29 of 221 of the Franco-Thai War (Vichy France vs Thailand). Russian Front - Finland: Day 123 of 142 of Operation SILVER FOX, a joint German-Finnish campaign to capture the Russian port of Murmansk in the Arctic. Russian Front - Finland: Day 121 of 140 of Operation ARCTIC FOX, a joint German-Finnish campaign against Soviet Northern Front defenses at Salla, Finland. Russian Front - Finland: Day 130 of 164 of the Battle of Hanko. The Soviets will be forced off their leased naval base. Russian Front: Day 130 of 167 of Germany's Operation BARBAROSSA. Russian Front - North: Day 52 of 872 of the Siege of Leningrad. Russian Front - Center: Day 28 of 98 of the Battle of Moscow. Russian Front - South: German troops advance in strength into the Crimea forcing the Russians to fall back in to Sevastopol, Ukraine. MTO - Libya: Day 203 of 256 of the Siege of Tobruk. East Africa: Day 507 of 537 of Italy's East African campaign in the lands south of Egypt. CBI - China: Day 1,576 of 2,987 of the 2nd Sino-Japanese War. Russian Front - North: Day 417 of 872 of the Siege of Leningrad. Russian Front - North: Day 178 of 658 of the Siege of the Kholm Pocket, USSR lays siege to the Kholm Pocket but the Germans hold out for a about a year and a half. Russian Front - South: Day 124 of 150 of Germany's CASE BLUE, the failed offensive to take the Caucasus oil fields. Russian Front - South: Day 68 of 165 of the Battle of Stalingrad, bloodiest battle in human history. MTO - Egypt: Day 7 of 20 of the 2nd Battle of El Alamein. US B-25s and P-40s attack the German lines at El Daba and El Alamein. MTO - Greece: The US 1st Provisional Bomb Group (B-17s and B-24s) attack the Maleme Airdrome at Crete. East Africa: Day 178 of 186 of the Battle of Madagascar. CBI - China: Day 1,941 of 2,987 of the 2nd Sino-Japanese War. PTO - Alaska: Day 145 of 435 of the Battle of Kiska, Aleutian Islands. The US and Canada will defeat the Japanese invaders. PTO - Malaya: Day 253 of 357 of the Battle of Timor Island, a long guerrilla war ending in Japanese victory. PTO - New Guinea: Day 101 of 119 of the Battle of the Kokoda Track. The Australians continue pushing back the Japanese troops. PTO - Solomon Islands: Day 84 of 187 of the Battle of Guadalcanal. US troops are able to retain control of all their positions, thus forcing the Japanese fleet to retreat. Russian Front - North: Day 782 of 872 of the Siege of Leningrad. Russian Front - North: Day 543 of 658 of the Siege of the Kholm Pocket. USSR lays siege to the Kholm Pocket but the Germans hold out for a about a year and a half. Russian Front - South: Day 67 of 122 of the Battle of the Lower Dnieper River, USSR. MTO - Italy: US 12th Air Force B-17s hit targets at Genoa, Sampierdarena, and San Giorgio. Fighters support the ground troops and attack the Giulianova harbor. CBI - China: Day 2,306 of 2,987 of the 2nd Sino-Japanese War. PTO - New Guinea: Day 41 of 219 of the Battle of Shaggy Ridge. PTO - New Guinea: Day 38 of 162 of the Battle of the Huon Peninsula. Atlantic: RAF Lancasters attack the German battleship TIRPITZ again with Tallboy bombs, this time off the coast of Tromso, Norway. ETO - France: Day 90 of 284 of the Battle of Brittany. ETO - Belgium: Day 58 of 62 of the liberation of Belgium. ETO - Belgium: Day 28 of 38 of the Battle of the Scheldt Estuary. ETO - France: Day 45 of 236 of the Siege of Dunkirk. ETO - Germany: Day 41 of 145 of the Battle of Hürtgen Forest. ETO - Germany: US 8th Air Force hits marshalling yards in Germany. Russian Front - Finland: Day 45 of 223 of the Lapland War. Finland and Russia have joined forces to kick the Germans out of Finland's most northern province. Russian Front - Finland: Day 23 of 23 of the Battles of Petsamo-Kirkenes. The Soviets have cleared the Germans out of the Arctic region in northern Scandinavia. The Russian objectives in the Arctic region have been met. Russian Front - Center: Day 15 of 206 of the Battle of the Courland Pocket in Latvia. Germans will hold this area until the very end of the war. Russian Front - Center: Day 8 of 99 of the Siege of Memel, a border town of Lithuania and East Prussia. Russian Front - Center: Day 46 of 72 of the Battle into East Prussia and northern Poland. Russian Front - Center: Day 14 of 15 of the Battle of Goldap, East Prussia. The Soviets begin pulling out. Russian Front - South: Day 24 of 24 of the Battle of Debrecen, Hungary. This battle ends in a draw as the Soviets have reshifted their focus on the capital city Budapest. Russian Front - South: Day 1 of 108 of the Battle of Budapest, Hungary. Russian Front - South: Day 46 of 72 of the Battle of Belgrade, Yugoslavia. MTO - Germany: US 15th Air Force B-24s bomb targets at Munich and other spots in southern Germany. MTO - Italy: US 12th Air Force fighters hit railroads in the Po Valley. CBI - Burma: Day 212 of 302 of the Chinese Salween Offensive in Burma. CBI - China: Day 2,672 of 2,987 of the 2nd Sino-Japanese War. Day 196 of 259 of Japan's Operation ICHI-GO. PTO - New Guinea: Day 191 of 481 of the Battle of Western New Guinea. PTO - Palau Islands: Day 45 of 74 of the Battle of Peleliu (Operation STALEMATE II). PTO - Philippines: Day 10 of 299 of the 2nd Battle of the Philippines, aka the Liberation of the Philippines or the Philippines Campaign. PTO - Philippines: Day 10 of 73 of the Battle of Leyte. Introduced into Congress two days before the fall of France and signed into law three months later as Luftwaffe bombs set London afire, the Selective Training and Service Act began the process by which fifteen million Americans were inducted into the armed services during WWII. Patton and Rommel served their countries through two World Wars. Their temperaments, both on and off the battlefield, couldn't be further apart from each other, but their approaches to modern warfare were very similar.